The light and easy way to roll your on the go. Roll from single wide up to king size (110mm) with full control. Roll long or short, fat or thin. Newly updated design with round segments for easier rolling. Made with natural bamboo (4.75 x 3.35 in flat). This bamboo mat work great. Cool party trick to have and simple to learn. Although the Mat is fraying a little already and it was just purchased. Pretty good device if you roll monster J's. I've been using a dollar bill (or a c-note to all the ballers out there) to do this exact thing for years, but there are size limitations. 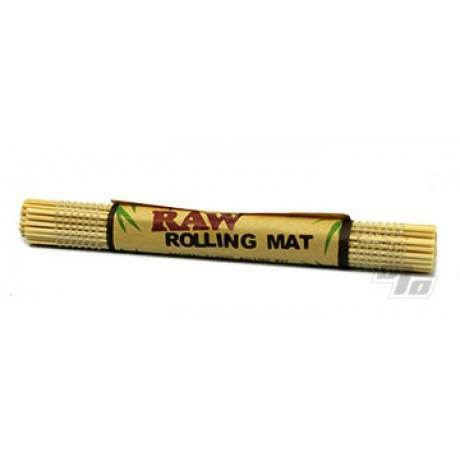 The Bamboo Rolling Mat is for you guys rolling giant hog-leg J's. And its cheap so pick one up and try it. Not quite as good as the originals, but works almost as well. Stiff ends aren't necessary. Works great but the ends are a little stiff.